FAI CEO JOHN Delaney has stated the €5 million that the soccer body received from Fifa in the wake of Thierry Henry’s controversial handball in 2009 was ‘properly accounted for’. Delaney made the revelation today when speaking to the Oireachtas Committee on Transport, Tourism and Sport. The soccer chief admitted it ‘was obviously a contentious matter’ but defended their handling of the matter. “In terms of the Fifa €5 million, it was obviously a contentious matter. A committee decided that it wouldn’t be discussed in this house. “That was a decision made maybe a year or two ago when deputy (John) O’Mahony was chairperson. 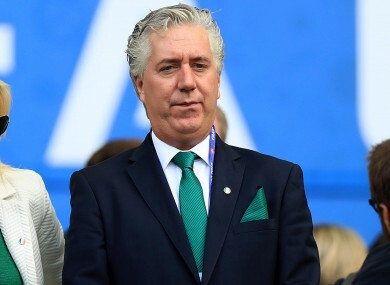 Delaney expressed his disappointment at the wave of scandals that have engulfed Fifa in recent times and rejected any suggestions that Sepp Blatter was a friend of his. “Yes, we were all disappointed with how events turned out in Fifa. I wouldn’t describe Sepp Blatter as a good friend of mine in any way or whatever description you gave, Deputy O’Mahony. I think that would be more than on the public record. “We voted for the new President Gianni Infantino, who’s bringing in some reforms in Fifa at the moment. I’m hopeful that more reforms will come. Addressing last week’s announcement that a 48-team World Cup would be in place from 2026 on, Delaney revealed his support for any initiative which would increase Ireland’s chances of qualification. “For countries like ourselves, it’s difficult to get to major tournaments and it’s important that we do. First of all to celebrate like we did last summer with our great supporters, to do well for a sense of national pride. “So in theory I and the FAI would be supportive of increasing the number of teams to 48. But we have meetings in Uefa next Monday and Tuesday under the top executive programme to find out how that affects Uefa . “So at the moment European positions are 13 at a World Cup, so 13 countries from Europe get to the World Cup, so how many extra slots would that mean for UEFA? Email “'All that money was properly accounted for' - Delaney defends FAI dealings with Fifa €5m payment”. Feedback on “'All that money was properly accounted for' - Delaney defends FAI dealings with Fifa €5m payment”.